Battlantis was a Konami arcade game made in 1987. It was a vertical shooter with a space invader style enemy layout, with additional enemies entering, special weapons and end of level bosses. The game has a total of 32 levels. The initial 16 will get you to the finial boss. After this point, levels are recycled using different color palettes and enemy configurations. If you manage to beat all 32 levels, the game is over. But honestly, if you complete the first you are good! Battlantis hardware included a Hitachi HD6309 primary CPU clocked at 3 Mhz and a Z80 sound CPU clocked at 3.6 MHz. 2 Yamaha YM3812 synthesizer chips provided music and sound effects. For sprites, the game uses a 007324 Tilemap Generator and a 007420 Sprite generator. Both these chips are custom chips made by Konami. The 007420 is "8 bytes per sprite with zoom. It uses 0x200 (512) bytes of RAM, and a variable amount of ROM." (from "konamiic.c") The zoom effect was most often put to use to create a 3d effect for objects. The color palette had 128 color possibilities, with 32 displayable at one time. All stages had a max of 16 colors and it appears the sprites get a separate 16 color palette. Music for the game was pretty good. There are 2 stage introduction melodies, 4 stage songs and 4 boss songs for the big bosses. Sound is all mono, and it sounds like one of the YM3812 is used for music, the other for effects. There are several levels of difficulty selectable with the DIP switches. The only difference I've seen is the rate at which the big bosses attack. This site has sat unreleased for 10 years. Despite not being complete it is going live. Should it generate any interest I will add more information. For now it is mainly contains the layout of each stage and music from the game. 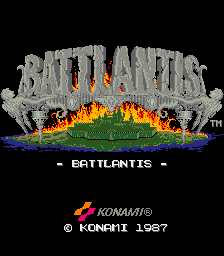 Battlantis is a trademark of Konami. 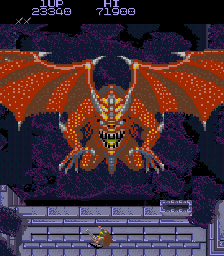 All images from Battlantis were captured from the 1987 Konami game.